When you think "fat loss" and think "strength" in the same thought, chances are you're thinking "I'm going to lose strength when I train for fat loss." And, in most cases, you'd be right. Most fat-loss training program aren't designed with strength in mind...the two goals are often thought of as mutually exclusive. With this High/Low Lactic Acid Training technique, you can actually train for fat loss while training for strength at the same time. The key lies in the weights and rep ranges. If you've tried my "Metabolic Surge - Rapid Fat Loss" program, you'll be familiar with this style of training. This style is used during several training days in the program. The results people have seen with it have been impressive. Basically, you're going to be going back and forth between high-rep sets with light weight and low-rep sets with heavy weight. You're going to be using the SAME exercise for BOTH types of sets and you're only going to be taking 20 seconds rest in between sets...pretty much just enough time to set the weight down, take a few breaths then pick up the other weight. This style of "short-rest" training is EXCELLENT for fat loss. The high reps are going to cause your body to kick out a TON of lactic acid. This is exactly what we want, because lactic acid production decreases pH levels in your body. Your body reacts to this acidity by secreting Growth Hormone, which is a very powerful fat-loss and muscle-building hormone. Honestly, if you're trying to lose fat while keeping muscle mass, it's your "secret weapon" hormone and you should do everything you can to maximize it in your body. This includes Lactic Acid-style training like this, done on an empty stomach. The other benefit of this style of training (especially using the heavy weights) is the overall impact on your metabolism you get from carrying more muscle. The more muscle you've got, the faster you'll lose fat...simple as that. This type of training maximizes not only the lactic acid/GH effect but also the benefits of heavy resistance in terms of keeping muscle and strength while losing fat...pretty much "use it or lose it." I'll use dumbbell bench press as the example. 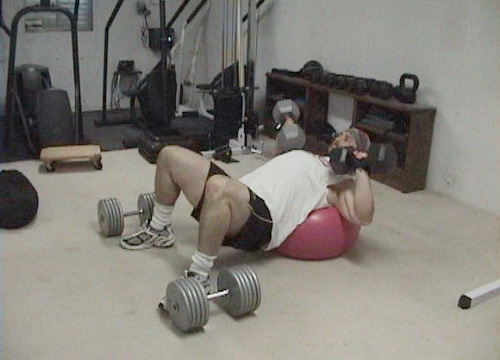 First, get yourself two sets of dumbbells and a bench (or Swiss ball, which I prefer for dumbbell bench press). The first set of dumbbells should be light to moderate weight...something you could get at least 20 to 30+ reps with on the first set. Set those down in front of the bench...you'll be using those first. Now bring over your second set of dumbbells. They should be fairly heavy...something you could normally get only about 6 to 8 reps with. Get into position on the bench with your light dumbbells and crank out as many reps as you can with them. The idea here is to push yourself until the burn from Lactic Acid forces you to stop the set. I'm using 50 lb dumbbells for the light weight. Put those dumbbells down and rest 20 seconds. It'll be easier to track this if you've got a timer. I recommend the Gym Boss timer. This thing is compact, easy to read and works PERFECT for timing rest in the gym. You can also keep track on a wall clock with a second hand or you can count at a moderate pace to 12. The reason I say count to 12 and not 20 is that it this will account for any slow counting and/or lag time in picking up or setting down weights. If you count to 20, you'll be resting too long - 12 is about right. Now pick up your heavy dumbbells. You're going to do a set of between 1 to 3 reps with these. I'm using 105 lb dumbbells for the heavy sets. Your body will still have the lactic acid floating around (though some will have been removed in just those 20 seconds), but because the set is so short, lactic acid won't be a limiting factor...muscular strength will. And while the light set worked your slow-twitch muscle fibers (more geared toward endurance), the heavy set is going to work your power-oriented fast-twitch fibers. AND...the rapid switch between energy systems is going to create a greater demand in your body, which will kick up your metabolism even more. Go back and forth between heavy sets and light sets until you've done the prescribed number of sets for that bodypart (see below for sample workouts). Then move on to the next exercise. Your body is in for a whole new experience with this style of training. Feel free to use whatever exercises you like with this technique. Remember, you're going to use the SAME exercise for the heavy and light sets. To do this in one rack, set the heavy barbell in the "regular" start position and set the light barbell on the safety rails, towards the back of the rack and do "bottom start" Anderson squats where you start with the barbell in the bottom position. Then go to regular "top down" squats. Just make sure the light bar is pushed all the way back as far as it can go. This video will show the transition and setup. Day 4 & 5 - Repeat Day 1 & 2 but with different exercises. If you like the looks of this program, check out the full "Metabolic Surge - Rapid Fat Loss" program that uses this training technique and also includes specific nutritional techniques that take even BETTER advantage of the training.